The ToughBuilt Waterproof Knee Pads are the versatile solution for wet and dirty jobs, from concrete to gardening. Pliable outer shell protects the knee on rough terrain while preventing scratches on the most delicate surfaces. Closed cell, high-density foam provides all-day comfort. Flexible accordion construction keeps out debris and maintains comfort while walking. A single elastic strap wraps around the upper calf avoiding painful bunching behind the knee. Easily cleaned off with water after every job. Waterproof Knee Pads The ToughBuilt Waterproof Knee Pads are the versatile solution for wet and dirty jobs, from concrete to gardening. Pliable outer shell protects the knee on rough terrain while preventing scratches on the most delicate surfaces. Closed cell, high-density foam provides all-day comfort. Flexible accordion construction keeps out debris and maintains comfort while walking. A single elastic strap wraps around the upper calf avoiding painful bunching behind the knee. Easily cleaned off with water after every job. Waterproof Knee Pads is rated 4.7 out of 5 by 21. Rated 3 out of 5 by 2Geez from Work great. Not that comfortable. Waterproof = Yes. Knee Protection = Yes. Good padding with clos... Work great. Not that comfortable. Waterproof = Yes. Knee Protection = Yes. Good padding with closed cell foam = Yes. Strap = uncomfortable. These work great for their intended purpose, but the strap retainer is on the inside of the foam and as a consequence it sticks into the side of my leg when I wear them. My use only has me wearing these for about 20 min at a time, so it is tolerable. I can't imagine what it would be like to have this poking the sides of my legs if I had to wear them for longer periods of time. I would only recommend these if you have a good pain tolerance or only need to wear them for a limited amount of time. Rated 5 out of 5 by aliboi269 from Great quality!... Great quality! Rated 5 out of 5 by Zaul from I highly recommend these for long term use, I forget... I highly recommend these for long term use, I forget that I have them on. Just a tip for comfort; don't adjust them too tight. Rated 4 out of 5 by MidnightCowboy from From all appearances, the Toughbuilt kneepads are what I was searching for. Not wearing them when... From all appearances, the Toughbuilt kneepads are what I was searching for. Not wearing them when working on broken stone and rough pavement.. I'm not sure of their durability. Time will tell the final determination. More.,as it brcomes known. Rated 5 out of 5 by Tony from I use the pads when I mulching. I love that the rubber top folds over the bend in my knee. Now, m... I use the pads when I mulching. I love that the rubber top folds over the bend in my knee. Now, much less, if any, mulch gets between the pads and my knees. I hope the yellow plastic attachments don't break when I put the pads on or take them off. My old knee pads had metal. I save them just in case. Rated 4 out of 5 by bobber from I have worn these three or four times. They were comfortable to wear. Seems like for yard work ... I have worn these three or four times. They were comfortable to wear. Seems like for yard work they adequate cushioning. Rated 5 out of 5 by Bossofme from After I joined a group of volunteers who build wheelchair ramps for people who can't afford to hi... After I joined a group of volunteers who build wheelchair ramps for people who can't afford to hire a contractor, I found myself on my knees quite a bit, which is a challenge for a 64 year old. Sometimes the ramps are built on lawns, which can be dewey in the mornings. 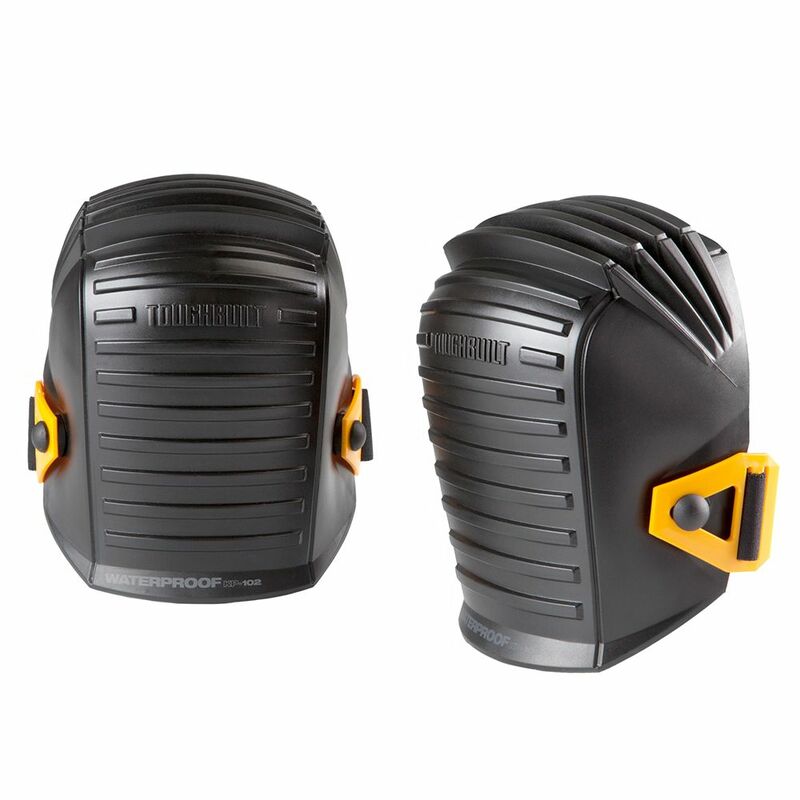 These knee pads are very comfortable to kneel in, they stay on throughout a several hour job, and they keep your knees from getting wet from surfaces. The only trouble I've had with them is that they make my knees sweat in hot weather. If I'm wearing jeans under them, the knees of the jeans get soaked. That's a small price to pay for the ability to kneel in comfort. I definitely recommend these. Rated 5 out of 5 by setholito from Good price. Arrived on time. Used it in my backyard. Was on my knees pulling weeds. Soft and comfortable. Easy to clean. Fits well.